According to our Virginia Beach and Hampton Roads mortgage experts, (Atlantic Bay and McLean Mortgage), it is a good idea to gather up all of the needed documents in advance before launching your house hunt, as this will make the mortgage pre approval process a lot easier. Before you start the entire house hunting and mortgage pre approval process, you should consider what you can really afford to buy and not necessarily what you are pre-approved for. The bank will want to see that you are able to make a down payment of at least 5% to 20% of the value of the home depending on the type of mortgage you may qualify for. Veterans Administration (VA) guaranteed loans have different “lesser” guidelines. Take your time to do lots of research in advance and seek out impartial advice on the mortgage market. There are so many options to choose from and a lot to consider, so the more knowledge you have the more prepared you are to make an informed decision. 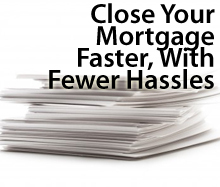 Use our preferred mortgage vendors for a no-non sense opinion. Part of your mortgage pre approval process should be taking a look at your credit report. The Government allows you to obtain a free copy of your credit report at this site. If you are asked to pay you are at the wrong site. These are just a few things to consider before applying for a mortgage pre approval. To find out more about mortgages or buying a home, contact your trusted mortgage professional today. When ready to start your search for homes contact us here. This entry was posted on Tuesday, January 21st, 2014 at 3:12 pm and is filed under Uncategorized. You can follow any responses to this entry through the RSS 2.0 feed. You can leave a response, or trackback from your own site.